Donald Chase Downes, the son of Joseph Lodowick Downes and Effie Chase Downes was born on 30th September, 1903 in Catonsville, Maryland. He attended Kent School and Phillips Exeter College. He then continued his education at Yale College in 1926. The author of Cloak and Gown: Scholars in America's Secret War (1987) has pointed out: "Downes collected Yale stories and regaled his classmates with gossip about their professors; he loved to keep late hours, reading, visiting, and then to sleep in the next morning, the janitor daily bringing him breakfast in bed. Even then his friends noticed Downes's quick passion, his ready commitment to what he regarded as the moral side in a controversy, and his general lack of respect for another person's system of knowledge: he stood outside other cultures, peering in, curious, unaffected, yet somehow and paradoxically angry with others for their failure to be curious themselves about how reality was essentially a moral construction." After leaving college he taught at a school in Great Barrington in Berkshire County and at Cheshire Academy. He returned to Yale and after completing his course work, he received his B.A. in June 1935 and accepted a teaching position at a school on Cape Cod, where he lived for the next five years. In his autobiography, The Scarlett Thread (1953) Downes argued: "I suppose it was Edmund Taylor who led me into my five years' career of paralegal crime. In 1939 he had published The Strategy of Terror, which described how Hitler was deploying a fifth column through all the democratic world and by paralysing the will to resist. I read the book over and over; it explained all the things I had seen on my recent trips to Europe." Downes offered his services to Office of Naval Intelligence (ONI) and secured a position as a teacher of English at Robert College in Istanbul as cover for his espionage work. He later recalled: "I was an intruder, and upstart outsider, an uninvited amateur forcing his way into the holy-of-holies of the hocus-pocus of secret services. Often I felt like a mere person in trade daring to enter a hoary and aristocratic club." In March 1941 Downes returned to the United States. He joined the Free World Association and at a meeting in New York City later that year he was approached by an agent of the British Security Coordination (BSC). As William Boyd has pointed out: "The phrase 'British Security Coordination' is bland, almost defiantly ordinary, depicting perhaps some sub-committee of a minor department in a lowly Whitehall ministry. In fact BSC, as it was generally known, represented one of the largest covert operations in British spying history... With the US alongside Britain, Hitler would be defeated - eventually. Without the US (Russia was neutral at the time), the future looked unbearably bleak... polls in the US still showed that 80% of Americans were against joining the war in Europe. Anglophobia was widespread and the US Congress was violently opposed to any form of intervention." The BSC agent told him that he was working under the direct orders of Winston Churchill. "Our primary directive from Churchill is that American participation in the war is the most important single objective for Britain. It is the only way, he feels, to victory over Nazism. Our best information is that the forces of isolationism, a front here for Nazism and Fascism, is gaining, not losing ground. How do you personally feel about these forces, for example, the America First movement." Downes replied: "I couldn't feel stronger. I can say further that I am quite honestly ashamed that my country is not a full-fledged, belligerent ally of Britain's"
Downes was asked if he was willing to spy on the American First Committee. "Do you feel strongly enough on these matters to work for us in your own country? To spy on your fellow Americans and report to us? For we feel there is German money and German direction behind the American First movement, though many of its followers may not know it and would in fact be shocked to know it. If we can pin a Nazi contact or Nazi money on the isolationists, they will lose many of their followers. It might be the deciding factor in America's entry in the war, if the American public knew the truth." Downes later recalled in his autobiography that he received assistance in his work from the Jewish Anti-Defamation League, Congress for Industrial Organisation and The Committee to Defend America by Aiding the Allies. He also worked closely with Colonel Eugene Prince of Army Counter-Intelligence Corps. 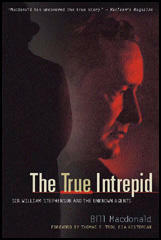 One source, Bill Macdonald, the author of The True Intrepid: Sir William Stephenson and the Unknown Agents (2001), has pointed out: "Downes eventually discovered there was Nazi activity in New York, Washington, Chicago, San Francisco, Cleveland and Boston. In some cases they traced actual transfers of money from the Nazis to the America Firsters." After the Japanese attack on Pearl Harbor Downes arranged with John Pepper, his boss at the British Security Coordination, to transfer to the Office of Strategic Services (OSS). At first he was based in Washington and worked under William Donovan and George K. Bowen, the head of Special Activities. Other senior figures he worked with included David Bruce (head of intelligence), Allen Dulles (head of the New York office) and William Lane Rehm (head of finance). Downes worked with Arthur Goldberg on the Labor Desk. "We were a fortunate combination, able to work together at high speed without friction. Our ideas, our plans, our points of view almost perfectly meshed; our abilities were peculiarly supplementary; our work so mutually understood and developed that each was able at any time to carry on or make a decision for the others." They recruited refugee German trade union leaders who had fled from Nazi Germany. Others who joined included Leon Jouhaux from France and Omar Becu from Belgium. They also persuaded Dr. Paul Schwarz (1882-1951), the former German Consul-General in New York City, to supply the OSS with information. Downes argued that Schwarz "began to spill the German beans - scandals, indiscretions, skeletons... In his forty years in the German foreign service, he had kept elaborate notes... This information he kept in huge filing cases, where there was all the gossip and facts about everyone of importance in German diplomatic and military circles for nearly half a century." Downes went to North Africa in 1943 and then Italy and Cairo. Downes returned to the United States in August 1944, but was sent back to Europe in February 1945 as a correspondent for a news agency. Downes remained in Europe after the war. In 1953 Downes published his wartime memoirs, The Scarlett Thread . As his biographer, Robin Winks, has pointed out: "When he published his memoirs in 1953, old-line professionals were outraged at the dirty linen he washed in public. He was viewed by those who were well to the right as left-winged, even pink, and though he hated Communists with the same passion as the Nazis, he tended toward socialism quite openly at the end of the war... Downes was, it seems likely, a homosexual in a business that had no tolerance level whatsoever for gays... There was a hint or two of Downes's alleged sexual predilection in his memoirs, and a virtually open admission in his correspondence with one or two quite close friends." 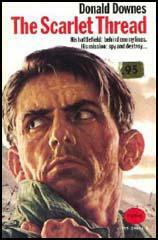 He also wrote spy thrillers such The Easter Dinner (1960) and A Red Rose for Maria (1961). His story, Orders to Kill, was made into a film directed by Anthony Asquith and was co-written by Paul Denn, a former member of the British Security Coordination. The story tells of a young American pilot, Gene Summers, who is selected to go on a mission to Nazi-occupied Paris to kill Marcel Lafitte, a man believed to be a double agent working in the French Resistance. When Summers arrives in Paris he meets his contact, Leonie, who provides information about the man he is to assassinate. Summers befriends Lafitte and the more he finds out about him, the more doubts he has of his guilt. Summers tells Leonie that he does not think Lafitte is a traitor. She becomes very angry, pointing out that Summers has dropped hundreds of bombs on people while he was a pilot. Summers replies that there is a difference between killing a lot of people and one person up close. Summers eventually agrees to murder Lafitte. After trying to kill him with a blow to the head he is forced to resort to stabbing him with a pair of scissors. He decides to steal Lafitte's money in order to make it look like a robbery. Summers returns to Leonie but discovers she has been captured by the Gestapo. He remains in Paris and after the liberation of the city by the Allies he is told that Lafitte was not a traitor and a loyal member of the resistance. Summers seeks out Lafitte's wife and daughter. He tells her that her husband was one of their best agents in the resistance and gives her the money he stole from their home. Downes took a close interest in military justice and the prosecution of war criminals. For many years he studied the case of German General Anton Dostler, who ordered the execution of 15 Office of Strategic Services officers on 26th March, 1944. In the first Allied war trial, Dostler was accused of carrying out an illegal order. He was sentenced to death and shot by a firing squad on 1st December, 1945. Downes never published the results of his inquiry. Donald Chase Downes moved to London in 1975 and returned to the United States in 1980. He died in California on 26th March, 1983. Downes's third year was equally unhappy, with poor marks, jaundice, many missed classes, and a severe suspension for an undisclosed infraction (with the written warning that he would be withdrawn from Yale on the next occasion). Warren Hunting Smith remembered Downes, who was a year ahead of him, very well, and thought him even then "quite a character." Downes collected Yale stories and regaled his classmates with gossip about their professors; he loved to keep late hours, reading, visiting, and then to sleep in the next morning, the janitor daily bringing him breakfast in bed. Even then his friends noticed Downes's quick passion, his ready commitment to what he regarded as the moral side in a controversy, and his general lack of respect for another person's system of knowledge: he stood outside other cultures, peering in, curious, unaffected, yet somehow and paradoxically angry with others for their failure to be curious themselves about how reality was essentially a moral construction. Downes eventually discovered there was Nazi activity in New York, Washington, Chicago, San Francisco, Cleveland and Boston. In some cases they traced actual transfers of money from the Nazis to the America Firsters. In January 1942, soon after my transfer from British Intelligence to the new OSS organization, I was called down to Washington to see 'K'. While I was entertained without restraint in the homes of Donovan, David Bruce, and the leaders of the new secret intelligence, they were, at first, wary about having me in their offices. I understood this well enough since my work for British intelligence had put the FBI on my tail and the no-man's-land between the FBI and OSS was dangerous territory, the more so in my case as I had worked for the British in those pre-Pearl Harbour days when J. Edgar Hoover and his boys had done everything possible to obstruct and embarrass British intelligence in the United States. This seemed particularly silly in the light of the fact that the President, the Army and the Navy had broken all sorts of laws in rushing aid to England after the fall of France. We were ready to help the English in all other ways in their lone stand against Nazism, but we were unwilling to help their intelligence service operate in America.